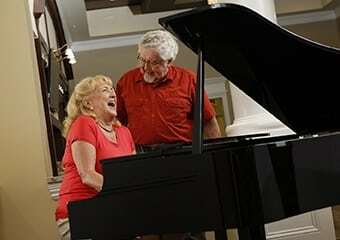 Our nicely appointed Assisted Living Clubhouse is the place where residents enjoy our exceptional lifestyle programs. A full-time Activities Director ensures there is always something happening! You can socialize with neighbors and friends, enjoy gourmet dining, attend special events and themed parties, meet with your club groups, get pampered in the salon or play cards in one of social areas. It’s also the spot for healthy living because the clubhouse is where you’ll find our our expert team of health and welllness professionals dedicated to helping you each and every day. It’s all you’ll need to live a happier and healthier life! Learn more about our Sensations Dining Program.